Remember: Before embarking on a paddle that all safety precautions have been undertaken and that “less than three paddlers there never should be”. Please note that descriptions of locations included does not provide permission to land as this must be obtained from the landowner. Iorras Aintheach peninsular and its surrounding bays. The Iorras Aintheach peninsular and its surrounding bays offer a scenic environment and potentially challenging sea kayaking opportunity for all levels of paddler. Added to these enticing prospects there is the cultural attraction of the Irish language (Gaelic) which is widely spoken, varied wildlife and strong maritime traditions which can be seen while journeying such as the gathering of seaweed, fishing and sailing. 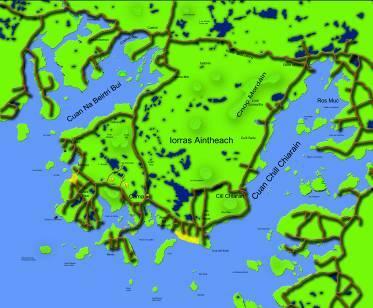 The major villages in the area are Carna, Cill Chiaráin, Ros Muc, Roundstone. The geographical environment of this peninsular and surrounding Connemara maritime waters provide an interesting mix of sheltered sandy beaches, tidal rapids, islands and exposed open water passages. All within a relatively short distance from one another. Depending on the type of group that is paddling and the prevailing weather conditions it is an excellent area to plan a route following the intricacies of the shore for an enjoyable day trip or as a stop off point for a longer expedition. Weather conditions can be unpredictable and unforgiving. When planning a tour it is vital that weather and tides are considered as there are areas where when wind meets tide large breaking waves can form and there are a large number of submerged rocky reefs which may turn a swell into pounding breakers that might ensnare the unwary. Low tides can make certain passages and landings impracticable except by prolonged detour, patience (several hours of a wait) or by treacherous portage across irregular and seaweed slippery rocks. Therefore you should plan your trip with a knowledge of how the tides may affect your planned route and in particular your planned launch or landing site. 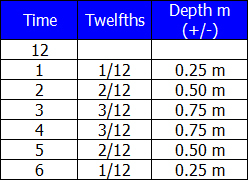 The rule of twelfths helps you make an estimate of tidal heights after or before predicted high or low tide. It is based on the assumption that tidal height increases smoothly to a maximum at half tide and subsequently decreases smoothly to zero at slack tide. To use this rule you must know the day, time and predicted height of high and low water for the location that you wish to visit (these may be found in a tide table or by visiting websites such as EasyTide). Then you must calculate the tidal range by subtracting the low tide height from the high tide height to find the tidal range. For example at the end of the first hour of a rising tide, it will have risen one twelfth. After the second hour it will have risen 1/12 over the first hour and an additional 2/12 for the second hour giving a total tidal rise of 3/12. After the 3rd hour it will have risen an additional 3/12 giving a total of 6/12. During the fourth hour the tide rises another 3/12, thereafter the rate of increase declines to 2/12 in the 5th hour and 1/12th in the 6th hour. The animation shows a pier with 12 steps above the low tide mark and the expected rise and fall of the tide during a tidal cycle over this range according to the rule of 12ths. Below is an example of the expected rise or fall of the tide with a 3m tidal range. 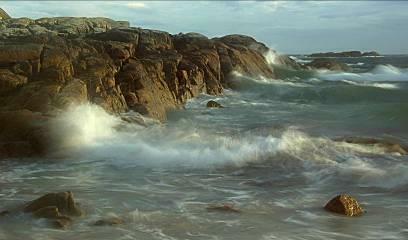 An example of the affect of the tide is shown in the video below. In this you will see the tide at low water spring (fully out) and then coming in (flooding) into Cuann na hAirde (close to Carna, Co. Galway)……………………………….. This tidal race creates a wonderfully diverse habitat for a variety of organisms.